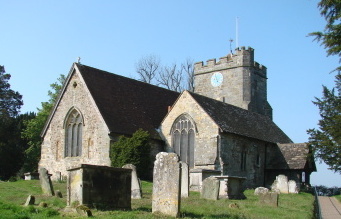 The nave may be C12, with a late C13 north aisle, a late C15 tower and a C19 south aisle. Waldron was a centre of the iron industry, but the church is smaller than in most such parishes. 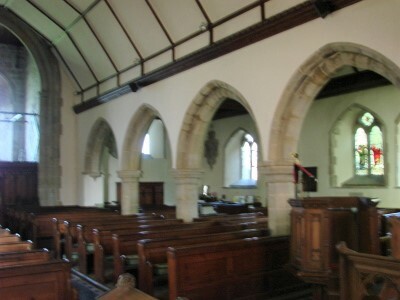 The broad nave is probably C12 and may always have lacked a chancel arch. The dating derives in part from a photograph of c1861 (see 1), showing the south side before the present aisle was added. Clearly visible is a plain round-headed doorway, relatively broad, which certainly looks C12. This south wall was said to be ‘very rude’ (3 p82), though the same photograph shows C15 segmental windows with rather indistinct tracery of two lights (see 1). 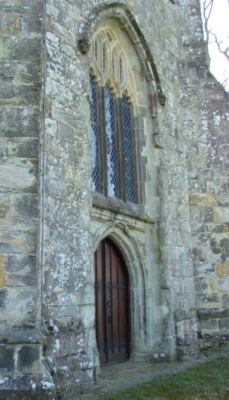 A north lancet with a concentric rere-arch shows the chancel was rebuilt or extended in the early C13. From the spacing, the blocked lancets either side of the C15 east window may have been the outer ones of five, an arrangement of which there are few examples in Sussex. In the late C13, a broad, gabled north aisle was added, with a cinquefoiled west lancet and simple bar tracery in the four windows. One is definitely a C19 insertion and though basically original, the others are not clearly shown on the undated Sharpe Collection drawing. More ambitious than most of the date, they are unexpected in a relatively small Sussex church. The four-bay arcade has octagonal piers and square chamfered responds with corbels for the inner order of the heads. The chancel windows are C15, together with the east window of the north aisle. The latter has panelled tracery superficially like the east window in the chancel, but rather later in detail. Of the two cinquefoiled single-light south chancel windows, one is a lowside with a transom. The north aisle roof was replaced, with moulded and castellated tiebeams and crownposts and the same c1861 photograph of the south side shows apparently C15 segmental windows with rather indistinct tracery of two lights, indicating that the replacement of windows at this date was extensive. Pevsner (BE p619) suggested the structure of the tower was C13, but all detail is late C15 and the uniform, coursed ashlar is more typical of that date. Its proportions recall others in the area linked to the Pelhams, who had large land-holdings in the parish, though their badge of the buckle is not present. According to Ley (3 ibid), in the late C18 there was some glass in the east window of a man in armour, with an inscription seeking prayers for the soul of John Pelham. Late C15 detail on the tower includes a weathered west doorway in a square frame with blank shields in the spandrels and a window, both contained in a large arch with head-stops. There are uncusped bell-openings, battlements and a square north east stair-turret and the characteristic tall arch has an inner order on round shafts. The segmental south nave windows, already noted, were probably contemporary. The Sharpe drawing shows the north side has been little changed, beyond the replacement of a plain porch and one new window. These date from the restoration and extension of 1859-62 by R C Hussey (WSRO Ep II/27/247). A Cheale of Uckfield, mentioned in a report of the work (B 21 p463), must have been the contractor, though assuming he was the younger of the two of that name, he elsewhere he acted as architect. Hussey added a south aisle, which follows the north one inside and out. 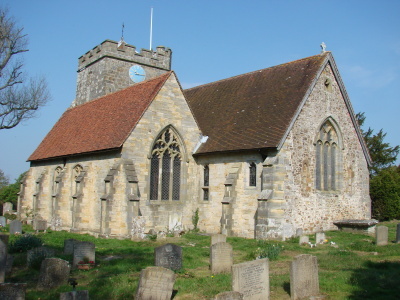 Otherwise, some external stonework was repaired and the south wall of the chancel was rebuilt, but the roofs of nave and chancel remained concealed by plaster. 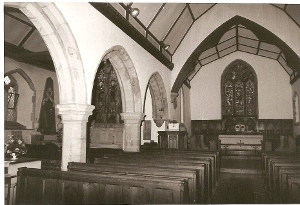 There was no attempt to insert a chancel arch, though the timber partition, mentioned by Ley, was renewed. There were repairs to the church in 1971-72 by J D Clarke and Son, the responsible architects being F E Ford and D Clarke (ICBS). Aumbry: (North chancel) Square and probably C13. 1, (Outside north aisle) Tub-font, found c1906 at a local farm in use as a cattle-trough (2 p126). Its proportions are shallower than most in the C11 and C12 when such fonts were common and there is no certainty that it was a font, let alone from this church. What may be the remnants of inset lead letters have been discerned (A K Walker p58). 2. C19 square bowl with corner-shafts, said to be a copy of one found in fragments at the restoration (2 p127). 1. (East window) Lavers and Barraud, 1863 (CT 29 Aug 1863). 2. (North aisle, second window) J Powell and Sons, 1912, designed by E Penwarden (Hadley list). 3. (South chancel, first and second windows) J Powell and Sons, designed by E Penwarden and J H Hogan, 1925 (ibid). 1. (North chancel) John Fuller (d1722), a local ironmaster. It extends almost to the full height of the wall and is of grey and white marble, with an obelisk flanked by urns. Though unsigned, it is clearly London work. 2. (North aisle) Bridget Dyke (d1722) Attributed to E Stanton and C Horsnaile (BE(E) p652). 3. (Churchyard) Two by J Harmer, both decorated with terra cotta rosettes. One is a tomb-chest. Niche: (east wall of north aisle) Late C13, quite shallow with a trefoiled head. Piscina: (South chancel) Small, plain pointed. C13.